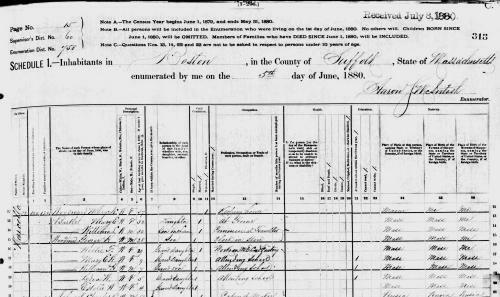 "Massachusetts Births, 1841-1915", database with images, FamilySearch (https://familysearch.org/ark:/61903/1:1:FX8C-SVJ : 1 March 2016), George Francis Woodward, 1876. 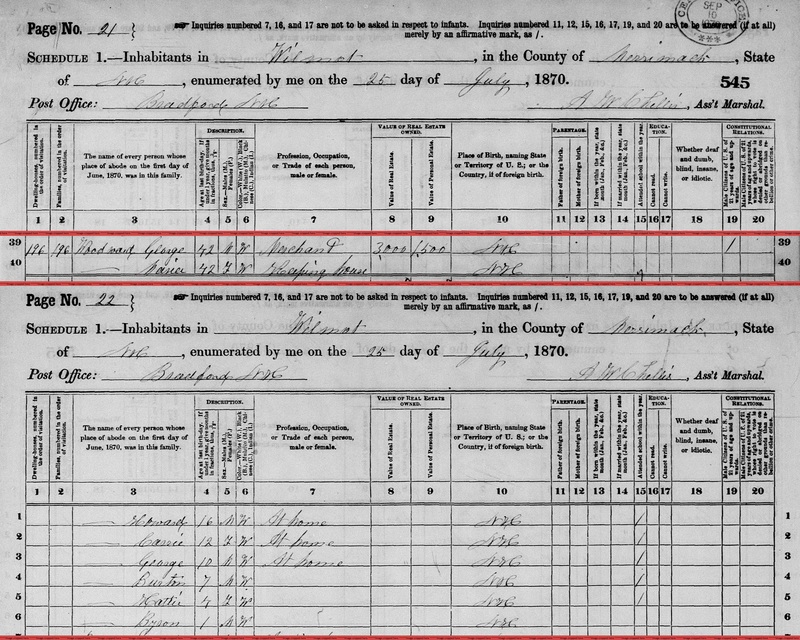 "Massachusetts Marriages, 1841-1915," database with images, FamilySearch (https://familysearch.org/ark:/61903/1:1:N4MH-ZJ8 : 17 February 2016), George H. Woodward and Frances M. Cartwright, 17 Nov 1875; citing , Boston, Massachusetts, United States, State Archives, Boston; FHL microfilm 1,433,035. 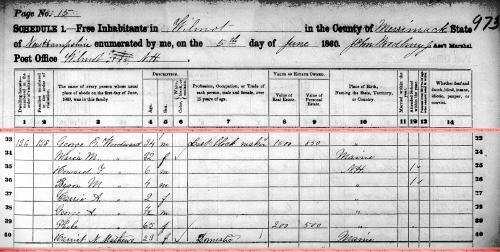 George H. Woodward was a merchant. Glenn died on April 12, 2016 in Midland, Midland County, Michigan, at age 58. Glenn Ernest Woodward passed away unexpectedly April 12, 2016 in Midland, Mich. Glenn was born to Eugene Elliot and Lois Jean (Chauncey) Woodward on March 25, 1958 in Midland. He was a proud 1976 graduate of Midland High School, Central Michigan University (Political Science) and Cooley Law School (Juris Doctor). Although he never practiced law, he continued to hold a passion for law and politics. He was a selfless caregiver, deep thinker, loved to read, watch sports, listen to music, work puzzles, passionate about political issues and enjoyed finding a good deal. He liked being an uncle and seeing the developing personalities of his nieces and nephews over the years. He suffered from undiagnosed medical conditions. The family would like to emphasize the care of self is as important as caring for others. 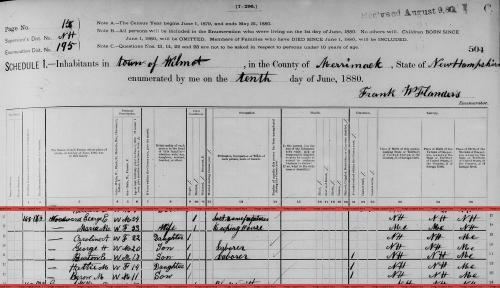 He was preceded in death by his mother and grandparents, Ernest Ames and Mary Mildred (Wenzel) Woodward; Clyde Everett and Grace Frances (Smith) Chauncey. He is survived by his father; twin sister, Sue (Mike) Banner; best friend and brother, Bob Woodward; sister, Kathy (Hans) Heikel; brother, Don (Ruth) Woodward; many nephews, nieces, grandnephews, grandnieces, cousins and particularly his friends he met with on a regular basis, you know who you are. A memorial service took place 2 p.m. Sunday, April 17, 2016 at the First United Methodist Church Chapel with the Rev. Dr. Charles Keyworth officiating. Those planning an expression of sympathy are asked to consider Boy Scouts of America or First United Methodist Church. 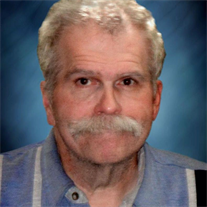 Condolences may also be sent to Gene Woodward, in care of: Candlestone 4124 Waldo Avenue, Midland, MI 48642. 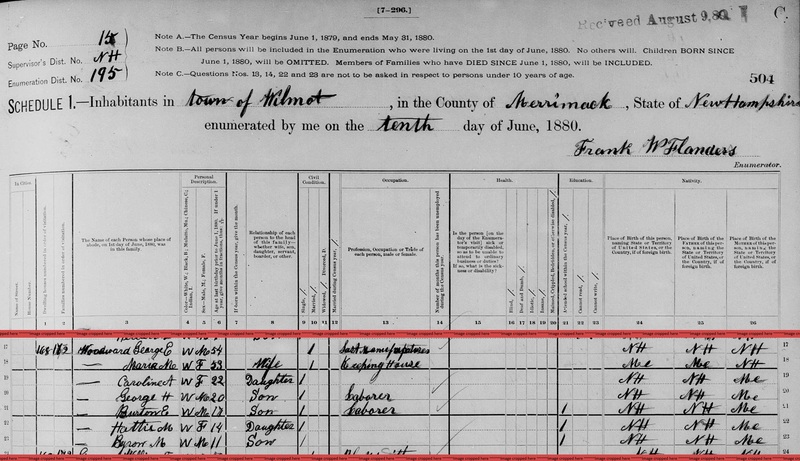 "United States Census, 1910," database with images, FamilySearch (https://familysearch.org/ark:/61903/1:1:M2VZ-BXD : accessed 10 December 2016), William E Corthell, Everett Ward 3, Middlesex, Massachusetts, United States; citing enumeration district (ED) ED 808, sheet 20A, family 414, NARA microfilm publication T624 (Washington D.C.: National Archives and Records Administration, 1982), roll 597; FHL microfilm 1,374,610. 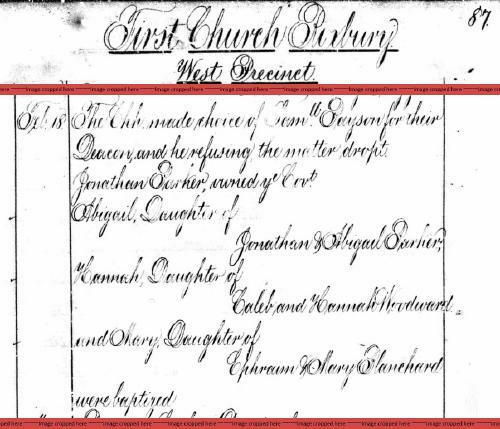 Hannah died on December 5, 1799 at age 46. Brookline (Mass. ), Vital Records of Brookline, Massachusetts, to the end of the year 1849., Salem, MA: The Essex Institute, (1929) , p. 87. Harlow E. Woodward is online at https://www.facebook.com/harlow.woodward. He was the son of Howard Harlow Woodward and Rebecca Maude Keefe. The Boston Directory for 1873 lists: "Woodward, Lewis & Co. [owned by] Harlow E. Woodward and George S. Lewis. publishers. 96 Washington St.
Woodward, Harlow E. partner, Woodward Bros., 468 Washington. house 50 Clarence, Roxbury. Woodward, Harlow E. partner, Woodward Bros, 40 Bromfield. house 29 Bainbridge. Woodward, Harlow E. medicines, 40 Bromfield. house 29 Bainbridge, Roxbury. 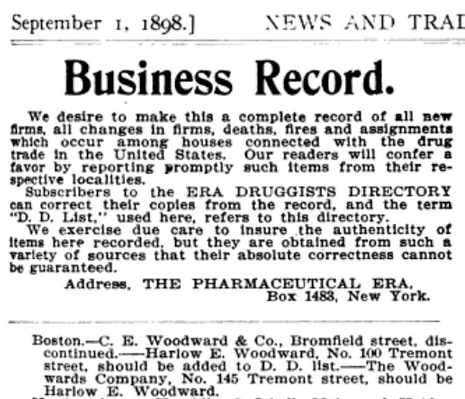 Woodward, Harlow E. medicines, 40 Bromfield and 100 Tremont. house 1 Dunreath. Woodward, C. Elliot, clerk 100 Tremont. boards 1 Dunreath. Ordered That the City Treasurer be hereby authorized to pay to Harlow E. Woodward and Clarence E. Woodward the sum of fifty-five and sixty-five one-hundredth dollars, being the amount held by the city under chapter 390, chapter 40 of the Acts of 1888 for the sale on an estate at 992 Harrison avenue for unpaid taxes of the year 1891, by deed recorded with Suffolk Deeds, lib. 2093, fol. 443. Another Cutter Fails -- Ten Per Cent! living at 1 Dunreath, Boston, Massachusetts. Woodward, Harlow E. medicines, 100 Tremont. house 1 Dunreath. 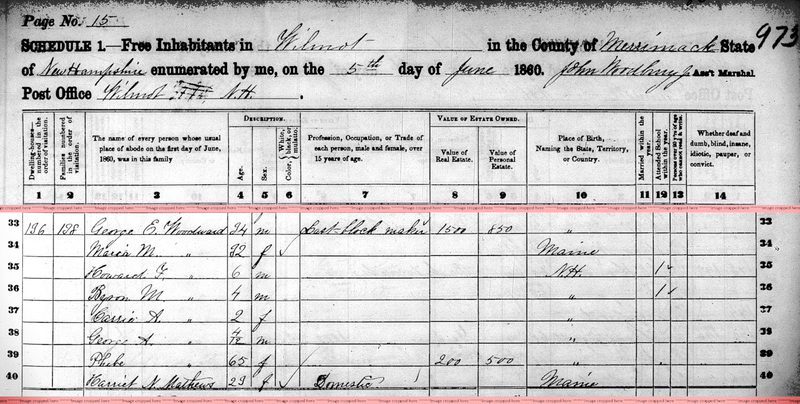 Massachusetts Vital Records, 1841-1910, , Vol: 52 ; Page: 214. [no title], The Farmers' Cabinet., Amherst, New Hampshire, 22 Jun 1871, Volume: 69; Issue: 49; Page: . Boston Daily Advertiser, Boston, MA: , Tuesday, June 06, 1871; Issue 132; col C.
New Magazines, Bangor Daily Whig & Courier, Bangor, ME, Friday, September 01, 1871, Issue 208; col E.
Massachusetts Vital Records, 1841-1910, , Vol: 255 ; Page: 89. Boston Daily Advertiser, Boston, MA: , Tuesday, December 08, 1874; Issue 136; col E.
Boston Daily Advertiser, Boston, MA: , Monday, August 13, 1888; pg. 3; Issue ; col A. Unknown author, "Portraits of Stamp Collectors", The Philatelic Journal of America Vol. 9, No. 4 (April 1894): p. 142-143. Boston Daily Advertiser, Boston, MA: , Friday, April 12, 1895; pg. 2; Issue 88; col D.
"Another Cutter Fails -- Ten Per Cent! ", American Druggist and Pharmaceutical Record, New York, N.Y.: American Druggist Publishing Co., (Dec 26, 1898) , p. 401. 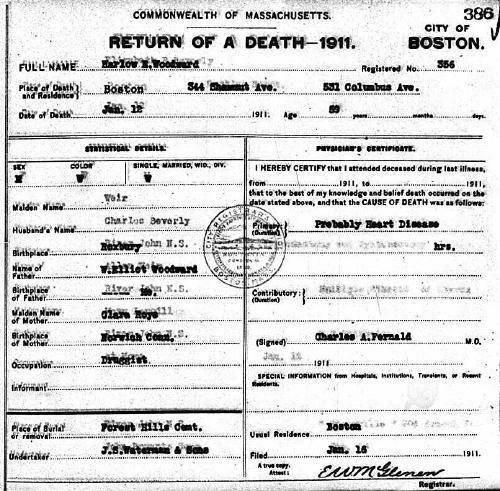 Harlow E. Woodward, Return of a death Reg. No. 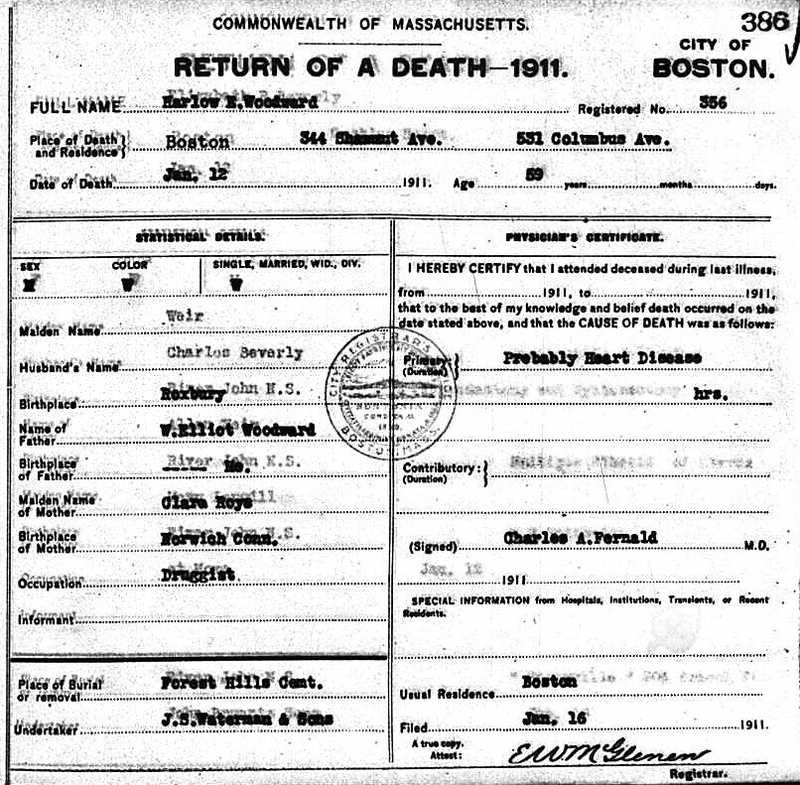 356 (filed 16 Jan 1911), Commonwealth of Massachusetts Registry of Vital Statistics and Statistics, 470 Atlantic Avenue, 2nd Floor, Boston, Massachusetts. 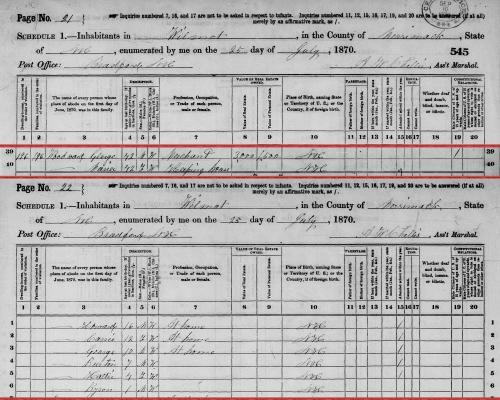 Harriet married Edward J. Norbut. Hyannis, MA: , November 19, 2004. Social Security Death Index, at http://www.ancestry.com/ssdi/advanced.htm, SSN: 016-12-3624. 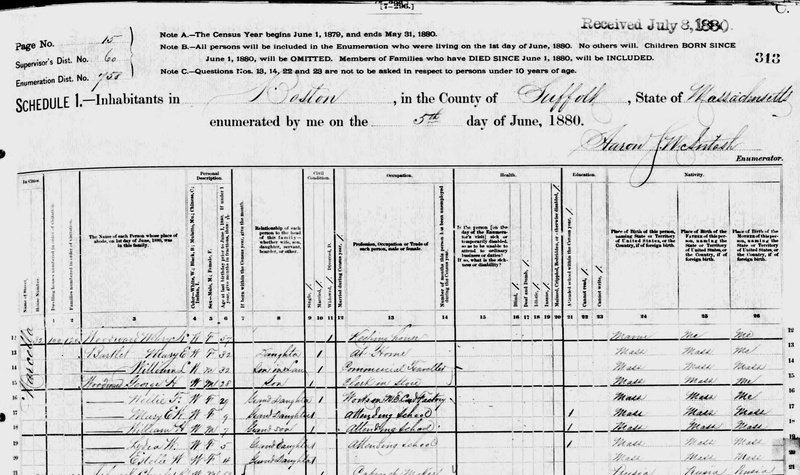 "New Hampshire, Death Records, 1654-1947," index and images, FamilySearch (https://familysearch.org/pal:/MM9.1.1/FSVP-YVQ : accessed 09 Dec 2012), George E. Woodward in entry for Harriet M. Woodward, 31 Mar 1935. 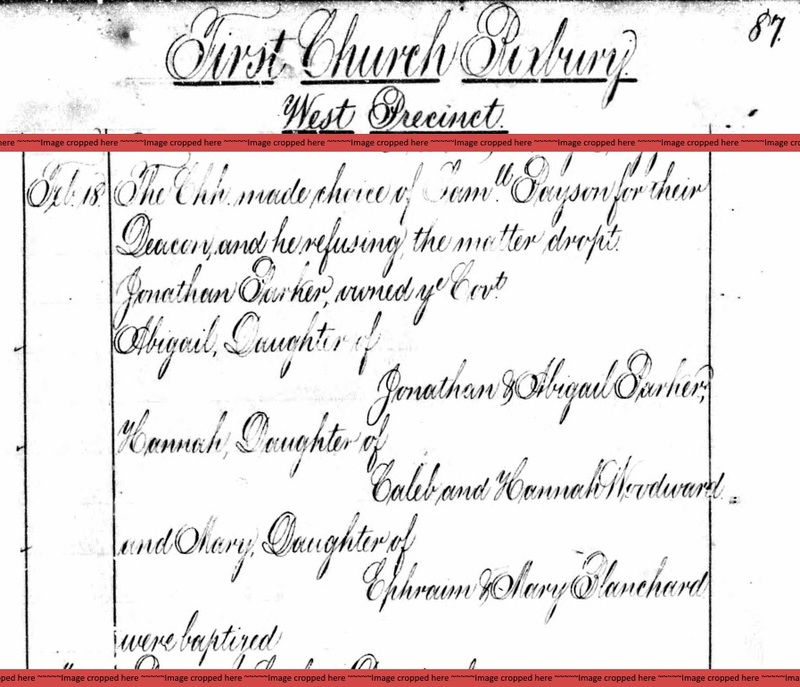 "New Hampshire, Marriage Records, 1637-1947," database with images, FamilySearch (https://familysearch.org/ark:/61903/1:1:FLZV-TR2 : accessed 27 July 2015), Andrew Joseph Simonds and Hattie Maria Woodward, 21 Apr 1919; citing Concord, , New Hampshire, Bureau of Vital Records and Health Statistics, Concord; FHL microfilm 2,070,423. 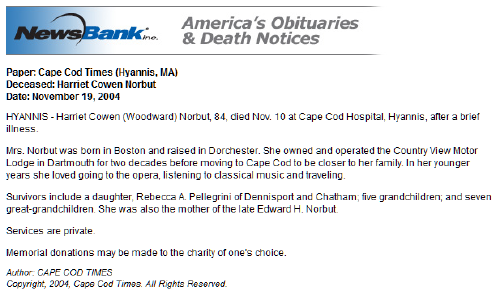 "New Hampshire, Death Certificates, 1938-1959," database with images, FamilySearch (https://familysearch.org/ark:/61903/1:1:QV3Q-L1ZT : accessed 27 July 2015), Hattie Normandy, 10 Dec 1948; citing Concord, Merrimack, New Hampshire, United States, p. No 5831-6166, New Hampshire Division of Vital Records, Concord.